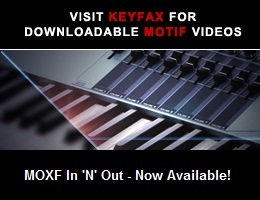 Viewing topic "Full potential of Master/Song/Pattern modes"
Have some questions regarding triggering patterns from sequencer Live on Motif XS . I need to trigger recorded patterns from 8 different tracks separately. 1) Which Mode is the best for my purpose? 2) Is there any chance assigning those Patterns to the particular key of Motif XS ? A possible method, if your XS has DIMMs installed, would be to resample the sequenced tracks, assigning the samples to keys of your choice. Be sure to SAVE your work to a USB drive, since DIMM memory is volatile and the data will have to be reloaded each time the XS is powered on. But would WAVs made on Motif XS be less in Megabytes if i do it in Cubase?